Artist and writer Kathy Polo tells the tale of hockey’s most outrageous–and surprisingly heartwarming–story in picture and verse. Few sports stories in the past year have been as emotional a rollercoaster as that of NHL enforcer John Scott. Scott–a journeyman player known less for his skills on the ice than for his ability to be 6’8″, intimidating, and eager to drop the gloves–earned his way into the NHL in 2006 after putting in time in college and the developmental American Hockey League. He’s played for the Minnesota Wild, the Chicago Blackhawks, the New York Rangers, the Buffalo Sabres, the San Jose Sharks, and the Arizona Coyotes in his time in the league–not the sort of guy that typically gets considered an all-star. But when the NHL opened the All-Star Game up to fan-voting this year, Scott–who had scored a total of 11 points in eight years in the league–found himself the recipient of a lot of enthusiasm. There was some debate as to whether the fan push was genuine or mean-spirited, but a lot of the groundswell had as much to do with Scott’s not being a traditional “All-Star” as with his personality–if anyone would embrace and enjoy being the black sheep of the All-Star Game, it would be the guy who once wore a T-shirt adorned with a photo of himself scoring a rare goal. When Scott ended up winning the fan vote, the NHL took dramatic action to keep him out of the All-Star Game, leading to a trade out of Phoenix and over to Newfoundland, Canada (in the middle of winter! )–and back in the American Hockey League, which just fueled the David vs Goliath aspect of the whole thing. And it all had a storybook ending. So how better to tell it than with an actual storybook? That’s what writer/illustrator Kathy Polo figured–and thus was born The Legend of John Scott, an illustrated, lightly-animated children’s book, written in verse, that tells the triumph that Scott–who ended up not just playing in the All-Star Game after fan outcry made the NHL reconsider their position on keeping him out, but also scoring two goals and being voted the game’s MVP–finally achieved. In a world not so far, but distant in candor, lived the league that held hockey, where legends would pander. From the greats of the Gretzkeys and the lores of the Orrs, the slapshots were plenty and the game much adored. And so came the year of two thousand and eight when John Scott played the game and got his very first taste. The NHL sure was Wild, and with each travel, he knew, this was the chance of a lifetime, what he’d been meant to do. And with eleven points on ice and five hundred in the box, he knew he’d be no Bourque, but he’d be the very best Scott. And then came the year when everything changed: The NHL returned with its gift, and left slightly maimed. The people loved Scott, and with a medley of motives, they voted him “Captain,” and lit off the explosives. But the league had forgotten that the fans had a voice, and John Scott was a player by that very league’s choice. The league disagreed, and they scoffed and retrieved, and behind some closed doors, they asked Scott to leave. And when Scott said he wouldn’t, and fans knew he shouldn’t, he’d been banished to the North – the league once more imprudent. With disdain and a laxness that left no one surprised, the league shunned Scott and his family and the many fans’ cries. And so the people took to war in articles and posts and headlines and forums, from all cities and coasts. 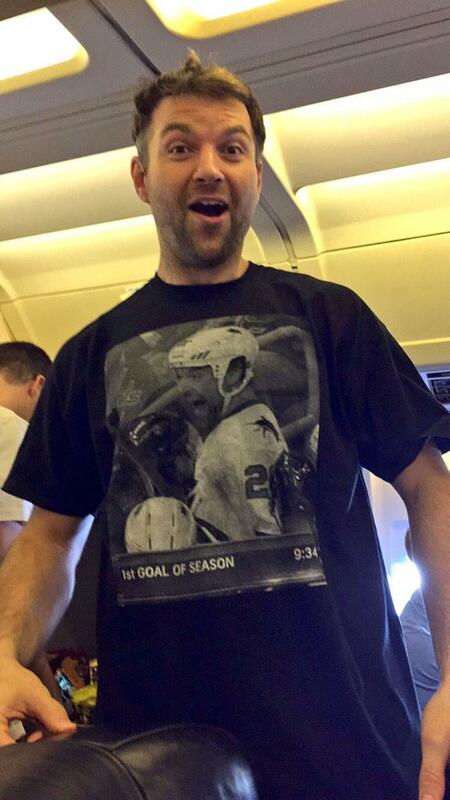 “Would your children be proud?” they questioned John Scott. They dug their own grave. They tightened the knot. Would your children be proud? If you were an NHL great? If you had an NHL title? If you’d been voted to play? Would your children be proud? If you took part in this “gift?” If you had the skill to compete apart from your size and your grit? “Would your children be proud?” John Scott knew that they would. And when he stepped to the ice, seventeen thousand fans stood. They were all proud that day – The thousands of children, the fans and admirers and believers within them. Because to celebrate greatness, as is done with these “gifts,” is to celebrate achievement in all strengths and all rifts. “Would his children be proud?” Scott had scored two fine goals. He brought life to the game; he defied his own role. “Would his children be proud?” Would you in their shoes? If you believed in yourself, and made the world believe, too? Greatness lives in many forms – not just the Hulls and Lemieux’s, and if you believe in yourself, you can amend the world’s views. So would his children be proud? Put yourself in their spot: We watched greatness redefined, in the legend of John Scott.